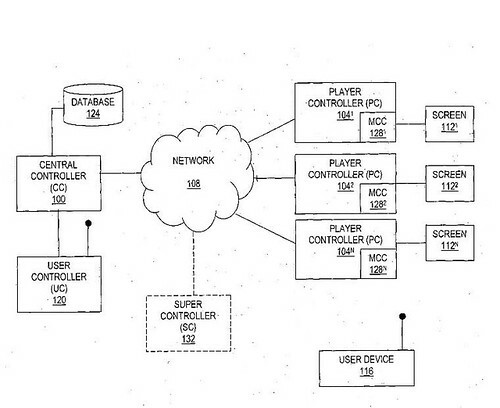 Screencap from US Patent 20040165006. IN JULY 2002, I started playing around with Typepad at night while drawing up a patent during the day. I think it's important to put the initial thoughts of the patent on my website, if only to serve as a point of reference for others investigating the same kind of intelligent digital signage. Work on the patented process started in July 2002. It would take another two years for Application Number 20040165006 to drop into the US Patent Office. Part of the idea is described by the sketch that accompanies this blog post. The patent filing calls for "methods and apparatus for an interactive media display (yo) utilize a screen that presents a content item to a viewer. The display of the content item is interactive, in that a user may remotely control the content presented on the screen, requesting or changing the displayed content item or in some way controlling the outcome of the content of the screen. The system is device agnostic, in that it operates with a wide variety of user devices, such as mobile phones, personal digital assistants (PDAs) equipped for wireless data access, or other mobile devices. In addition to its device-agnostic capabilities, the present invention is display-agnostic, utilizing, for example, cathode ray tube displays, liquid crystal displays, plasma displays, organic light-emitting diode displays, electronic ink displays, and projection screen displays. In another aspect, the present invention provides methods and apparatus for the generation of an interactive media display". I know I'll look back with the knowledge that few people in Ireland were experimenting with Java, WAP, SMS and MP4 files sent across WiFi to locations hundreds of meters away. That's what we were planning in July 2002. That's what we did during the Kilkenny Arts Festival in August 2002.